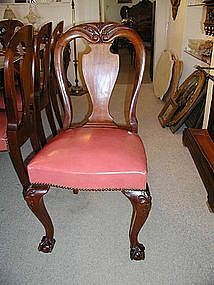 Lovely set of twelve mahogany dining room chairs, circa 1880. They have carved knees leading to ball and claw feet. The two arm chairs measure 39 1/2" tall x 24" wide, and the ten side chairs measure 38" tall x 20" wide. 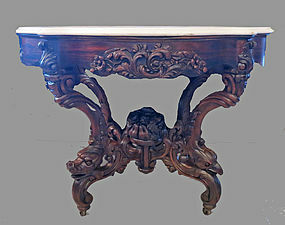 American Victorian Renaissance Revival library table, circa 1880. Walnut and burl in beautiful original condition, this table measures 48" long x 28" wide x 29" tall. It has a leather top and one drawer. This is a wonderful tiger oak secretary with a cylinder roll desk. It is circa 1890, Eastlake, with chipped carvings throughout. Its not ornate - its beautifully elegant. It measures 92" tall x 36" wide x 22" deep and is in absolutely beautiful condition. It comes apart in two pieces for moving. The graining on the wood is the best of its kind. 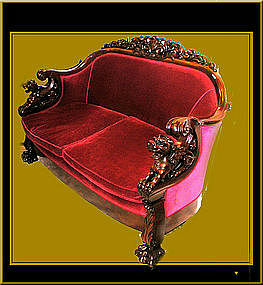 Heavily carved mahogany settee and chair with full winged griffons on arms, paw feet, and carved, reticulated tops. Probably by either Horner or Karpin. Settee measures 48" tall x 63" wide x 36" deep and chair measures 40" tall x 32" wide x 34" deep. One of the most beautifully carved pieces we've ever had the pleasure to offer for sale. 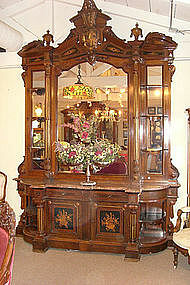 Fabulous, huge, Rosewood American Victorian Renaissance Revival etagere. Embellished with marquetry musical instruments and flowers, this beautiful piece is in all original condition, has been in the same family since it was bought in the 1870s. It measures 10'2" tall x 7'3" wide x 24" deep. Absolutely the most beautiful American Victorian dresser I've ever seen! Made by Mitchell & Rammelsberg circa 1870, this mahogany dresser is 9'3" tall, by 60" wide, by 25" deep. It has three long drawers over another hidden drawer, and all interiors are maple. Pictured in Dubrow's book "Styles of American Furniture," there is one like it in the Newark Museum. The carving of a women's head at the very top is just beautiful. We will be happy to answer any questions you may have. Beautiful little three drawer drop leaf work table, early 19th century, made of mahogany as the main wood and the drawers decorated in tiger maple. 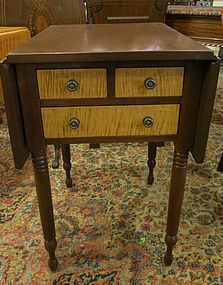 It is in excellent original condition, with the bottom of all the drawers chamfered. It measures 30" tall x 19 1/2" wide x 24" deep when the sides are down, and 40" wide when both sides are up. It has its original brass pulls. 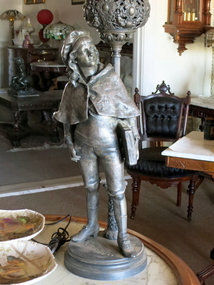 Beautifully detailed spelter lamp of a school boy dressed in knickers and a cape, holding his book under his arm. 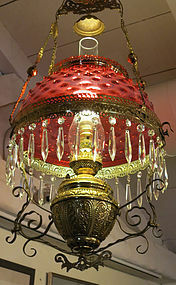 The whole lamp stands 41" tall with an 8" diameter on the base. The figure of the boy, without the base or the font, stands 20 1/2" tall. There is a small chip on the top rim of the shade, but everything else is in perfect condition. This is one of the nicest lamps of its kind that I've had. Lovely solid oak American hall tree with mirror and bench. This condition is perfect, and it measures 6'10" tall x 39" wide. There is a bench that lifts up so you can put shoes, gloves or anything else that you want to hide inside. It has hooks for hats and/or coats and a very pleasing shape. 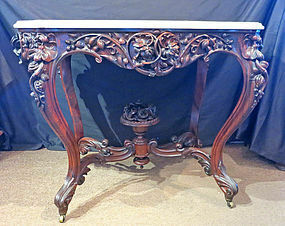 Victorian walnut picture frame marble top table, circa 1880. 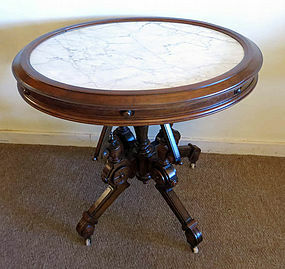 The marble is white, the table has an above average base that is quite lovely. The table measures 30" tall x 32" wide x 24" deep. This rare and wonderful table was made by John Henry Belter circa 1850-1860. It has a white marble top, and four c-scrolled legs - each one different. There is a dolphin, an eagle, a boar and a hound. The table measures 29" tall x 42" long x 32 3/4" deep. 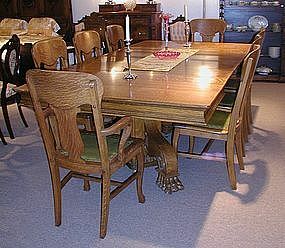 A table exactly like this one sold at Neal Auction in 2003 for $50,000. This is a very rare and wonderful piece of Americana. Lovely Renaissance Revival hall stand, circa 1880. It is walnut and all the decoration is burl. It will hold up to ten hats or coats, and has the original iron pans on the bottom. It measures 91" tall x 43" wide x 16" deep and is in beautiful condition. 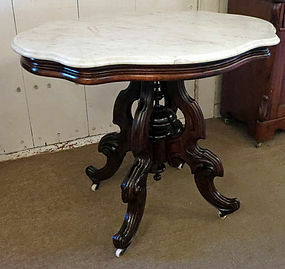 Lovely white marble turtle top table with rosewood base circa 1880 in excellent condition. 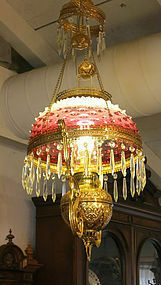 It has a lovely base with a large finial in the center. It measures 29" tallx 36" wide x 26" deep. 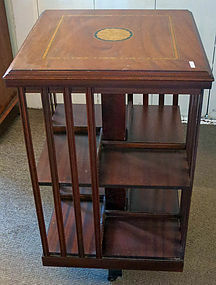 This is a lovely revolving bookcase, circa 1910. 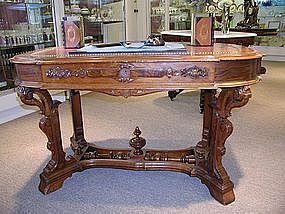 It is mahogany, with a shell style inlay on the top. There are two shelves on each of the four sides. The bookcase itself measures 31" high x 19" deep. This very unusual table measures 52" square when closed, and has four leaves, each measuring 11 1/2" wide, bringing the table to 98" long when full extended. There is a center leg for support. The base has huge paws with decoration on the pedestal. It is in perfect condition.